Gunmen killed an opposition lawmaker in Nairobi and police and soldiers in helicopters fired on crowds in the Rift Valley on Tuesday, the latest flare-up of the ethnic fighting that has gripped Kenya since last month's disputed presidential election. Groups of armed youths began gathering after the lawmaker's shooting in the capital's Mathare and Kibera slums. Sabat Abdullah, a slum resident, said a gang hefting machetes dragged a doctor from the president's Kikuyu tribe from his clinic "and then cut and cut until his head was off." Since the Dec. 27 election, the death toll across a country once among the most stable in Africa has soared to over 800. Much of the violence has pitted other tribes against Kikuyu, long resented for their dominance of Kenyan politics and business. Police said the killing of opposition lawmaker Mugabe Were as he drove to his house in suburban Nairobi Tuesday was being treated "as a murder but we are not ruling out anything, including political motives." Kenyan police spokesman Eric Kiraithe said: "We are urging everyone to remain calm." Were was among a slew of opposition members who won seats in the legislative vote held at the same time as the presidential election. The opposition, which won the most seats in parliament, accuses President Mwai Kibaki of stealing the presidential vote. "We suspect the foul hands of our adversaries," main opposition leader Raila Odinga said as he made his way Tuesday to Were's home, where dozens of protesters manned burning barricades of tires and uprooted telephone posts. "No Raila, no peace!" they yelled. Police fired tear gas at unarmed mourners who had been taunting them from the compound of Were's home. Kibaki condemned the killing, appealed for calm and promised police would act swiftly to ensure the perpetrators were dealt with severely. A resident of Nairobi's Kibera slum, Teddy Njoroge, said that in the wake of Were's death, houses were being set ablaze near a railway that generally divides members of Kikuyu from Odinga's Luo people. Flames and smoke rose from one area of Kibera. Just outside Kibera, people looted sacks of World Food Program rations and fled when police arrived. In the Mathare slum, armed Luo men at a roadblock dragged a Kikuyu man from his car and attacked him with machetes, volunteer aid worker Fospeter Ouma said. "They slashed him so much. I think he must have died," he said. Angry supporters of Were in the slum area of Dandora, the murdered politician's constituency, set fire to homes and shops owned by Kikuyus and brandished axes and machetes. Police fired tear gas, and later live bullets, to disperse them, and beat them with clubs. An AP Television cameraman saw a policeman pursue protesters down a mud road, shooting at them with a pistol. 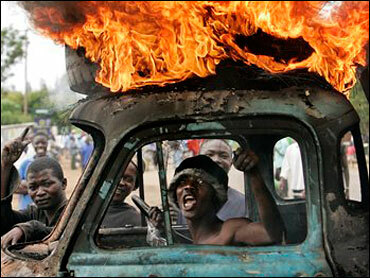 In the Rift Valley, about 5,000 people set fire to homes and smashed shop windows in Naivasha, dragging away goods. Five police officers fired into the air but were unable to control the turmoil. Naivasha's police chief tried to calm the crowd but was pelted with stones and fled in his car. A police helicopter and two military helicopters then flew over the crowd and officers began shooting, sending people running in panic. A reporter saw two bodies with bullet wounds, but it was unclear whether they were shot by officers in the air or on the ground. Reporters also watched the helicopters swoop down, with officers firing on a mob of armed Kikuyus pinning down hundreds of Luos outside the Naivasha Country Club. Kikuyus, armed with machetes and clubs inset with nails, had prevented the Luos from escaping for two days. On Tuesday, police began evacuating them, and police chief Grace Kakai said the helicopters helped. "There were very big crowds gathering and we had to disperse them so we used helicopter patrols. They were not firing at the crowd. We were trying to scare them, not hurt them," she said. Some 300 Luos had been evacuated, she said. The Rift Valley has seen some of the worst of the postelection violence. At least 90 people were killed there over the weekend. U.S. presidential hopeful Barack Obama, the Democratic senator whose father was Kenyan, appealed for peace on Nairobi's Capital FM radio station. "Now is the time for all parties to renounce violence. Now is the time for Kenyan leaders to rise above party affiliations and past ambitions for the sake of peace," Obama said. Kibaki and Odinga blame each other for the violence, which has driven 255,000 people from their homes. The two men have traded accusations of "ethnic cleansing." Human rights groups and officials charge the violence has become organized. Obama said that "Most troubling are new indications that the violence is being organized, planned and coordinated." He added: "The senseless and tragic violence poses an urgent and dangerous threat to Kenyans, Kenyan democracy, and stability and economic development in a vital region." On the diplomatic front, Kibaki and Odinga together with mediator and former U.N. Secretary-General Kofi Annan formally opened the "dialogue process," with the rivals under international pressure to share power. Odinga insisted what needed "the most urgent attention" was the resolution of the flawed election results - an issue Kibaki has indicated is not negotiable. Kibaki deplored the fact that some Kenyans "have been incited to hate one another and view each other as enemies." Annan told them: "The people need you. They want you to take charge of the situation and do whatever possible to prevent the downward slide into chaos that is threatening this country."